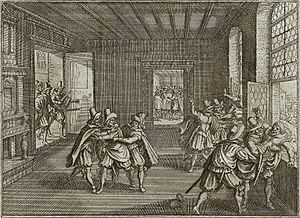 The Defenestrations of Prague (Czech: Pražská defenestrace, German: Prager Fenstersturz, Latin: Defenestratio Pragensis) were two incidents in the history of Bohemia in which multiple people were defenestrated (that is, thrown out of a window). 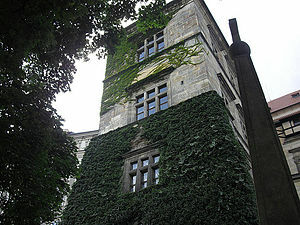 The first occurred in 1419, and the second in 1618, although the term "Defenestration of Prague" more commonly refers to the second. Each helped to trigger a prolonged religious conflict inside Bohemia (the Hussite Wars, 1st defenestration) or beyond (Thirty Years' War, 2nd defenestration). The First Defenestration of Prague involved the killing of seven members of the city council by a crowd of Czech Hussites on 30 July 1419. Jan Želivský, a Hussite priest at the church of the Virgin Mary of the Snows, led his congregation on a procession through the streets of Prague to the New Town Hall (Novoměstská radnice) on Charles Square. The town council members had refused to exchange their Hussite prisoners. While they were marching, a stone was thrown at Želivský from the window of the town hall and allegedly hit him. This enraged the mob and they stormed the town hall. Once inside the hall, the group defenestrated the judge, the burgomaster, and several members of the town council. They were all killed by the fall. King Wenceslaus IV of Bohemia, upon hearing this news, was stunned and died shortly after, supposedly due to the shock. The procession was a result of the growing discontent at the contemporary direction of the Church and the inequality between the peasants, the Church's prelates, and the nobility. This discontent combined with rising feelings of nationalism increased the influence of preachers such as Jan Želivský, influenced by John Wycliffe, who saw the state of the Catholic Church as corrupt. These preachers urged their congregations to action, including taking up arms, to combat these perceived transgressions. The Second Defenestration of Prague (here: 50°05′25″N 14°24′06″E﻿ / ﻿50.090233°N 14.401640°E﻿ / 50.090233; 14.401640) precipitated the Thirty Years' War. In 1555, the Peace of Augsburg had settled religious disputes in the Holy Roman Empire by enshrining the principle of Cuius regio, eius religio, allowing a prince to determine the religion of his subjects. The Kingdom of Bohemia since 1526 had been governed by Habsburg kings, who did not force their Catholic religion on their largely Protestant subjects. In 1609, Rudolf II, Holy Roman Emperor and King of Bohemia (1576–1612), increased Protestant rights. He was increasingly viewed as unfit to govern, and other members of the Habsburg dynasty declared his younger brother, Matthias, to be family head in 1606. Matthias began to gradually wrest territory from Rudolf, beginning with Hungary. In 1609, to strengthen his hold on Bohemia, Rudolf issued the Letter of Majesty, which granted Bohemia's largely Protestant estates the right to freely exercise their religion, essentially setting up a Protestant Bohemian state church controlled by the estates, "dominated by the towns and rural nobility". Upon Rudolf's death, Matthias succeeded in the rule of Bohemia (1612–1619) and extended his offer of more legal and religious concessions to Bohemia, relying mostly on the advice of his chancellor, Bishop Melchior Klesl. Conflict was precipitated by two factors: Matthias, already aging and without children, made his cousin Ferdinand of Styria his heir and had him elected king in 1617. Ferdinand was a proponent of the Catholic Counter-Reformation and not likely to be well-disposed to Protestantism or Bohemian freedoms. Bohemian Protestants opposed the royal government as they interpreted the Letter of Majesty to extend not only to the land controlled by the nobility or self-governing towns but also to the King's own lands. Whereas Matthias and Klesl were prepared to appease these demands, Ferdinand was not; in 1618 he forced the Emperor to order the cessation of construction of some Protestant chapels on royal land. When the Bohemian estates protested against this order, Ferdinand had their assembly dissolved. Lord Paul Rziczan read aloud... a letter with the following approximate content: His Imperial Majesty had sent to their graces the lord regents a sharp letter that was, by our request, issued to us as a copy after the original had been read aloud, and in which His Majesty declared all of our lives and honour already forfeit, thereby greatly frightening all three Protestant estates. As they also absolutely intended to proceed with the execution against us, we came to a unanimous agreement among ourselves that, regardless of any loss of life and limb, honour and property, we would stand firm, with all for one and one for all... nor would we be subservient, but rather we would loyally help and protect each other to the utmost, against all difficulties. Because, however, it is clear that such a letter came about through the advice of some of our religious enemies, we wish to know, and hereby ask the lord regents present, if all or some of them knew of the letter, recommended it, and approved of it. Before the regents gave any answer, they requested that the Protestants give them the opportunity to confer with their superior, Adam von Waldstein, who was not present. If they were given the opportunity, the Protestants were to receive an official answer to their grievance by the next Friday (the encounter took place on the eve of Ascension Day, and they all had to observe the holy day). The Protestant lords, however, demanded an immediate answer. Two regents, Adam II von Sternberg and Matthew Leopold Popel Lobkowitz, were declared innocent by the Protestant Estate holders, deemed to be too pious to have any responsibility in the preparation of the Emperor's letter. They were removed from the room; before leaving, Adam II von Sternberg made it clear that they "did not advise anything that was contrary to the Letter of Majesty". This left Count Vilem Slavata of Chlum and Count Jaroslav Bořita of Martinice (who had replaced Thurn as Castellan), both known Catholic hard-liners, and Philip Fabricius, the secretary to the Regents. They eventually acknowledged responsibility for the letter and, presuming they would only be arrested, welcomed any punishment the Protestants had planned. Count von Thurn turned to both Martinice and Slavata and said "you are enemies of us and of our religion, have desired to deprive us of our Letter of Majesty, have horribly plagued your Protestant subjects... and have tried to force them to adopt your religion against their wills or have had them expelled for this reason". Then to the crowd of Protestants, he continued "were we to keep these men alive, then we would lose the Letter of Majesty and our religion... for there can be no justice to be gained from or by them". Shortly thereafter, the two Regents and their secretary were defenestrated, but they survived the 70-foot (21-metre) fall from the third floor. Catholics maintained the men were saved by angels or by the intercession of the Virgin Mary, who caught them; later Protestant pamphleteers asserted that they survived due to falling onto a dung heap, a story unknown to contemporaries and probably coined in response to divine intervention claims. Philip Fabricius was later ennobled by the emperor and granted the title Baron von Hohenfall (literally "Baron of Highfall"). Immediately after the defenestration, the Protestant estates and Catholic Habsburgs started gathering allies for war. 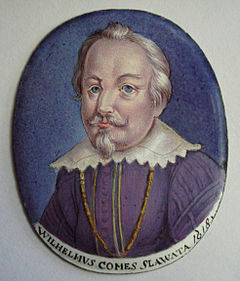 After the death of Matthias in 1619, Ferdinand II was elected Holy Roman Emperor. At the same time, the Bohemian estates deposed him as King of Bohemia and replaced him with Frederick V, Elector Palatine, a leading Calvinist and son-in-law of the Protestant James VI and I, King of Scotland, England and Ireland. Because they deposed a properly chosen king, the Protestants could not gather the international support they needed for war. Just two years after the defenestration, Ferdinand and the Catholics regained power in the Battle of White Mountain on November 8, 1620. This became known as the first battle in the Thirty Years' War. There was plundering and pillaging in Prague for weeks following the battle. Several months later, twenty-seven nobles and citizens were tortured and executed in the Old Town Square. Twelve of their heads were impaled on iron hooks and hung from the Bridge Tower as a warning. This contributed to the resentment that gave rise to the Thirty Years' War. A defenestration (chronologically the second defenestration of Prague, sometimes called one-and-halfth defenestration) happened on 24 September 1483, when a violent overthrow of the municipal governments of the Old and New Towns ended with throwing the Old-Town portreeve and the bodies of seven killed aldermen out of the windows of the respective town halls. Sometimes, the name the third defenestration of Prague is used, although it has no standard meaning. For example, it has been used to describe the death of Jan Masaryk, who was found below the bathroom window of the building of the Czechoslovak Ministry of Foreign Affairs on 10 March 1948. The official report listed the death as a suicide. However, it was widely believed he was murdered, either by the nascent Communist government in which he served as a non-partisan Foreign Minister, or by the Soviet secret services. A Prague police report in 2004 concluded after forensic research that Masaryk had indeed been defenestrated to his death. This report was seemingly corroborated in 2006 when a Russian journalist said that his mother knew the Russian intelligence officer who defenestrated Masaryk. ^ a b c Wolfsgrüber, C. (1907). "The Austro-Hungarian Monarchy". The Catholic Encyclopedia. New York: Robert Appleton Company. Retrieved 11 August 2014. ^ AmericanInPrague.EU. "Defenestrations of Prague, Czech Republic, Bohemia". AmericanInPrague.EU. Retrieved 2018-03-06. ^ Wallace, Peter (2004). The Long European Reformation. New York, NY: Palgrave Macmillan. p. 155. ^ Helfferich, Tryntje (2009). The Thirty Years War: A Documentary History. Indianapolis: Hackett Publishing Company. p. 16. ^ Beaulac, S. (2000). "The Westphalian Legal Orthodoxy – Myth or Reality?" (PDF). Journal of the History of International Law. 2 (2): 148–77. doi:10.1163/15718050020956812. ^ a b Gutmann, Myron P. (1988). "The Origins of the Thirty Years War". Journal of Interdisciplinary History. 18 (4): 764–765. doi:10.2307/204823. JSTOR 204823. ^ a b Gould, Stephen Jay (1996). "This View of Life: The Diet of Worms and the Defenestrations of Prague" (PDF). Natural History (9). Archived from the original (PDF) on 28 March 2014. Retrieved 26 January 2014. ^ Horáková, Pavla (11 March 2002). "Jan Masaryk died 54 years ago". Radio Prague. Retrieved 4 April 2009. ^ Richter, Jan (10 March 2008). "Sixty years on, the mystery of Jan Masaryk's tragic death remains unresolved". Radio Prague. Retrieved 25 October 2009. ^ Cameron, Rob, "Police close case on 1948 death of Jan Masaryk – murder, not suicide", Radio Prague, 06-01-2004. ^ Cameron, Rob, "Masaryk murder mystery back in headlines as Russian journalist speaks out", Radio Prague, 18-12-2006. Henry Frederick Schwarz, The Imperial Privy Council in the Seventeenth Century (Cambridge, Mass. : Harvard University Press, 1943, issued as volume LIII of Harvard Historical Studies), pp. 344–347 (it contains an English translation of part of Slavata's report of the incident is printed in).